At Brimmer & Heeltap, we love change. We embrace it. Change isn’t scary – it’s rad! For us, change means new menu items, beers we’ve never tried before, and the uncorking of unfamiliar wines. There are so many uncertainties that come with being inspired by the Pacific Northwest’s seasons and its whims that we think it’s best to just have fun with it. Here’s some ch-ch-ch-changes to our menu that you might not have had the chance to try just yet. There are two words that best describe our current menu: creativity and comfort. Chef Mike Whisenhunt and the culinary team have been getting seriously creative with everything from the ingredients they’re using to the plating of our many delicious dishes. Not one to ever play it safe with his flavors, Chef Whisenhunt has been blowing our minds with recent additions to the menu. Smoked ahi tuna with koji pimento broth, black sesame, and charred scallions. 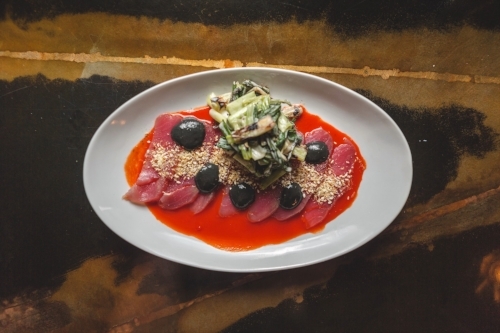 The smoked ahi tuna served with koji pimento broth, black sesame, and charred scallions is a perfect example of this. Subtly smoky, and with deep flavors that play off of one another incredibly, this is easily one of our new favorites at the restaurant. We recommend kicking off your meal with this beautiful dish as a way to awaken your palate and ready yourself for more bold tastes to come. Chef Whisenhunt's delicious lamb shoulder fried rice. Another phenomenal new menu item is the lamb shoulder fried rice. Rich and comforting, this play on a banh mi features warm spices, pickled chiles, carrots, daikon and mint. It’s everything you want to eat when it’s cold outside. The kitchen isn’t the only place whipping up all kinds of new treats to get excited about. 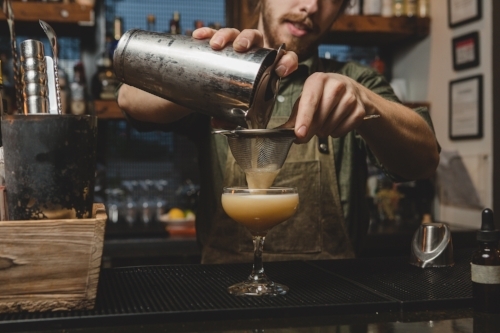 Our fantastic bar manager Brian Hibbard and the rest of our super talented bar team are embracing all kinds of new, unexpected ingredients to make drinks that will knock your socks off. The “Scandinavian Mustache” is a great example of this. Made with Krogstad Aquavit – a flavorful spirit mainly produced in Scandinavia – Cynar, lemon, egg whites, and lavender bitters, this cocktail offers a flavor profile that many of us were unfamiliar with (and instantly gushing over). Brian prepares the Scandinavian Mustache, a phenomenal new cocktail on the list. If you’re more into beer and wine than cocktails, our ever-changing offerings definitely won’t let you down. 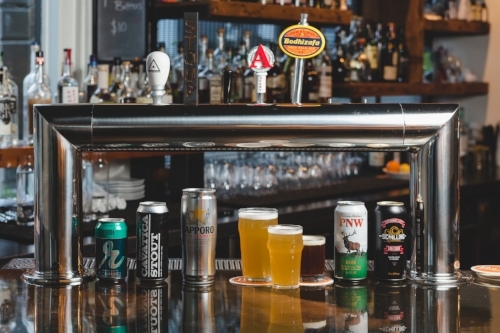 Brian has been doing his part to keep a rotating list of fantastic locally-made brews on tap, so if you love beer from Holy Mountain, Stoup, Avery, E9, Georgetown Brewing Co. and many other amazing local breweries, you will definitely not be disappointed. We L-O-V-E beer at B&H! Come in soon to try something local and tasty! Our wine list is also thoughtfully curated, and boasts a beautiful selection of old world wines and bottles from the Pacific Northwest. Proprietress Jen Doak is particularly excited about the 2014 Occhipinti SP68, a super-limited vintage produced by badass female winemaker Arianna Occhipinti. Bold and elegant, this bottle is just one of many that can be enjoyed on its own or paired with much of Chef Whisenhunt’s menu. The 2014 Occhipinti SP68 is just one of many beautiful wines we're offering by the bottle right now. Another exciting addition to the beverage menu is our just-in-time-for-the-holidays homemade 5-month aged eggnog! Since the early summer months we’ve been excitedly awaiting the release of this seasonal treat, and now that it’s here, we’re all feeling a little more prepared for the cold, damp winter weather we’ve been awaiting. Supplies of this excellent batch are limited, so be sure to cozy up to the bar soon to try it for yourself! 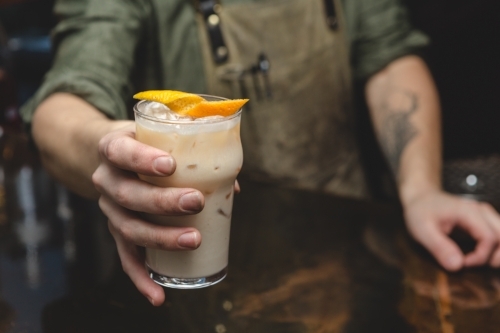 Combine eggs, cream, milk, nutmeg, tequila, scotch, and sherry, wait five months, shake and serve on ice with bourbon and an orange twist and...voila! We give you our over-the-top delicious homemade aged eggnog. This is just a small sampling of what’s new and exciting on the menu right now. Because our food and beverage offerings change often, what we’re serving now might not be here for long. So, come in soon to try something new! We promise that this change is a good one.